As is tradition, before all the hustle and bustle of ads and Black Friday shopping strategies, family talk lends to heart felt discussions of those most special to us and of all the things we are so thankful for in our lives. At the top of my list, of course, are my beloved children, my devoted husband, as well as our furry, four legged kids! I am certain mothers around the world feel the same. Beyond being thankful for my family's existence and presence in my life, I am also grateful for their health. While our family has certainly experienced its share of trials and tribulations, nearly every day, I learn of a family, a mother, a child who has, or is, experiencing a much harder path in life. 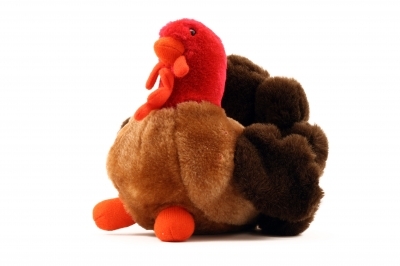 While my extended family gathers, with all the fun and excitement that only a gaggle of cousins, from ages two to sixteen can bring to a Thanksgiving celebration, I am reminded of how fortunate my husband and I were with my uncomplicated pregnancies, as well as the challenges my sister faced during her own pregnancies. Although I was induced in my first pregnancy and my second child was delivered by Cesarean due to an uncooperative cervix, both of my children were a bit shy about the birthing process, electing to enjoy their special, inside seats well into week 41.
at six months with her first, delivering just before week 37. With the subsequent pregnancies, bed rest was ordered as a precaution at three months. Although a long hibernation period sounds quite tempting, especially during my more hectic weeks, from my own experience with a four week bed rest order in my second pregnancy, as well as four months of immobility post a ruptured Achilles tendon, I am well aware that the appeal wears off quickly. Especially so when one is concerned about the health and well being of their unborn child. Thankfully, only my eldest nephew was born prematurely, however, even in the thirty seventh week, there are special concerns. Although my sister's obstetrician was quite thorough in educating my sister about the special health concerns for Preemies, it is disheartening to learn that so many mothers are unaware of threat of RSV, particularly to Preemies. RSV, or Respiratory Syncytial Virus is a danger to all children, however, of special concern to Preemies, is an air born, contagious disease that is typically spread by infected persons when they cough or sneeze. RSV can live on inanimate surfaces and can also be passed on to new hosts when one touches an infected item. 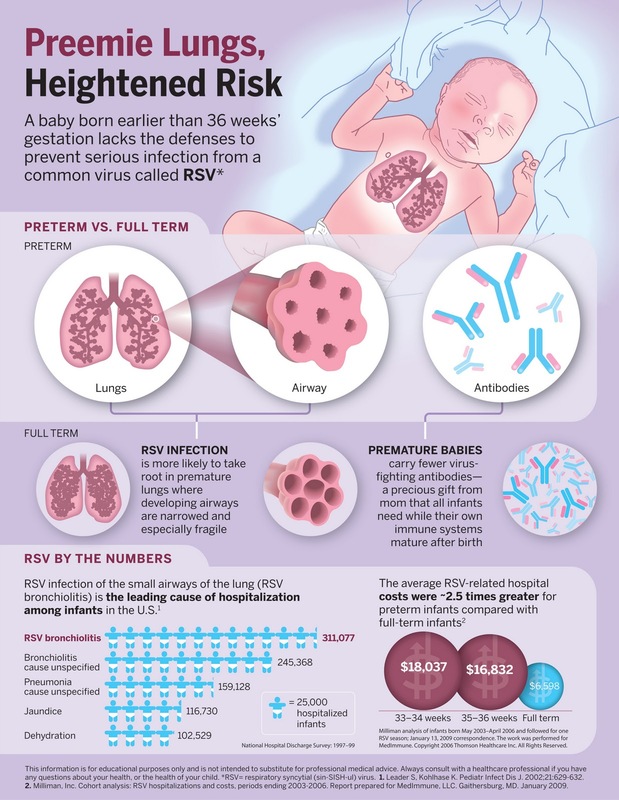 Over half a million premature babies a year, or 1400 per day, are infected with RSV. This dangerous disease affects over 13 million children annually, worldwide. RSV is the leading cause of infant hospitalization . Over 125,000 hospitalized in the US each year. RSV is responsible for over 500 infants deaths in the US, annually. Over one third of all mothers are unaware of RSV and it danger it presents. Why are Preemies at special risk from RSV? Any child born before week 37 of gestation period is considered a "Preemie". Even at that late time in a pregnancy, the early birth interrupts development and can stunt vital organ growth. Preemies are especially susceptible to infections and viruses as they lack the full force of full term baby antibodies. Note: As so many of the above symptoms are also typical of common cold, the warning signs of RSV are often overlooked! While these steps cannot guarantee your child will not contract RSV, as so many Preemie do before the age of two, following these guidelines will significantly reduce the risk! Wash hands, toys, bedding and play areas often. Insist that family members and visitors use hand sanitizer. Avoid large crowds and those that are ill.
Do not allow anyone to smoke around your baby. Talk to your doctor if you think your child is at high risk for RSV; there is special preventative therapy available for Preemies! Protect your Preemie and Help Prevent RSV deaths in Preemies by spreading the word and learning more! Has anyone in your family or in a family you know been infected by RSV? Is there a Preemie baby in your family? Tell me your experiences and insights in a comment below! I wrote this review while participating in a blog tour by Mom Central Consulting on behalf of MedImmune and received a promotional item to thank me for taking the time to participate. The opinions are experiences above are both honest and my own. Information, images and statistics provided by MedImmune & Mom Central. Turkey Image. My children were not at all preemie thank goodness but my friend`s last baby (#4) was born 7 weeks early at 3 lbs. Luckily his lungs were fine and he did not get RSV but he certainly could have! Love the babies images too! RSV is such a scary topic for the new mom. This is a great post to help allivate their fears with education!! I remember when my babies were born I was so scared they was going to get RSV. Thank God they didn't! Being a new mom is very scary! There are so many things that can harm your precious little baby! This is very informative; I don't have children, but I still find this important to know! Thank you!